Interactive Tokyo is held on Miraikan (National museum of emerging science and innovation), a science museum for children and young people in Tokyo, since 2005. Recently, chances to meet with media arts, such as Japan Media Arts Festival are increasing. 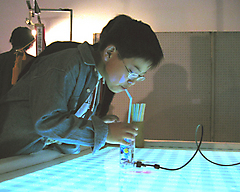 However, there are few events, which show 'interactive techniques' based on technologies like virtual reality and interface-techniques in Japan. Though activities of Japanese researchers in foreign academic conferences such as SIGGRAPH Emerging Technologies are remarkable, there is almost no chance to exhibit them. Therefore, the organization committee of Interactive Tokyo is organized to held Interactive Tokyo in Miraikan. 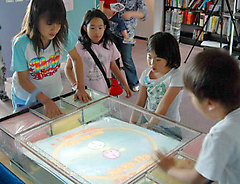 Interactive Tokyo exhibits highest level demonstrations of interactive techniques and promotes enlightenment of the public and internal research motivation. Finally Interactive Tokyo aims to be an international festival of interactive techniques. * Demonstrations for emerging interactive techniques for the public. 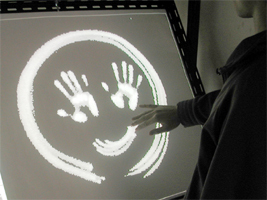 * Promotion and propagation of interactive techniques. * Sharing of knowledge of virtual reality, entertainment and interactive techniques. * Promotion of collaboration between experts, edge researchers and industry. * Out reach of interactive techniques. 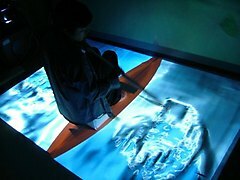 "Virtual Canoe", Shoichi Hasegawa et al. "Ton2", Hiroshi Yabu et al. "ThermoPainter", Daisuke Iwai et al. "Straw-like User Interface", Yuki Hashimoto et al.